When you need to workout at night, Athlé has got you covered. With our 3-in-1 reflective bands, you're guaranteed ultimate safety and protection whenever you're getting your run on. Jog and exercise with peace in mind no matter the time of day or weather condition. Remain visible and seen with our bands that fit right on your wrist, ankles, leg, and arms! When you're choosing safety with Athlé you aren't compromising anything else! Increased protection and maximum comfort so you won't even feel them on your skin! The elastic material makes sure that it won't rub up against your skin and cause irritation or pain. They're fully adjustable with a Velcro-like strip so you can securely keep them as tight or loose as you need them to. You can also create a "Daisy Chain" and connect 2 or more together for a larger band that can fit your waist, helmet or hips. Men and women, young and old - our reflective equipment is guaranteed to fit anyone so everyone can get their exercise with safety. They are really easy to put on and take off so anyone can get used to them! Get a 2 pack and wrap these bands around both your wrists to alert anyone of your presence. Get a 4 pack and put them on your arm or ankles for even more visibility. With Athlé you're guaranteed top quality running and exercise gear that anyone can use and love! Get yours today and workout with authority! EXERCISE WITH SAFETY: Whether you get up at the crack of dawn, head out at dusk or night; keep out of the dark with arm bands, wristbands & ankle bands with up to 1,400 feet of visibility. SMOOTH AND COMFORTABLE: Made from breathable elastic, they will securely wrap around your wrists for a supremely cozy and comfy fit that won't irritate, pinch, or suffocate your skin. MULTIPURPOSE BANDS: Perfect for practically any outdoor exercise activity you need to be seen; perfect for running, jogging, biking, hiking, and backpacking. Great for cycling pants cuffs. 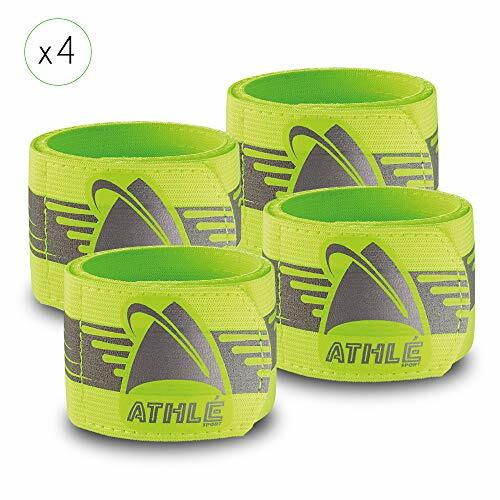 ONE SIZE FITS ALL: Our wrist bands use a Velcro-like closure so they're easy to put on and take off - the bands are 16 inches so they will certainly fit any wrist, arm, or ankle with flexibility. If you have any questions about this product by Athle`Sport, contact us by completing and submitting the form below. If you are looking for a specif part number, please include it with your message.